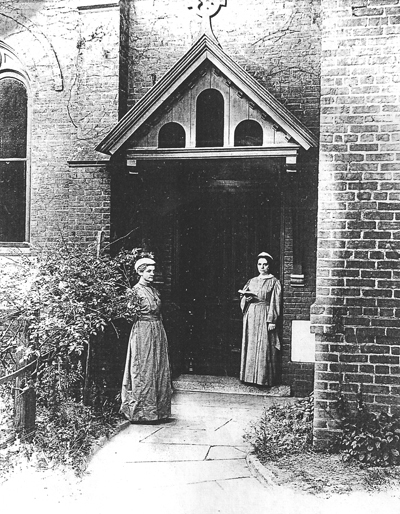 Sister Elenor, left, and Sister Sophie, right, at the entrance to Appleton's Beckwith Chapel, 1915. Research using newspaper articles, census records, cemetery records, and a historic diary in the Appleton Archives have revealed many details about the women who served as Deaconesses in the Order of St. Katharine. Before actually forming the Order, Bishop John Beckwith designated Margaret Jennings as the first deaconess to lead the Home. A Confederate widow, Mrs. Jennings came from Trinity Church in New Orleans, where Beckwith had served as priest. She became Sister Margaret and served as Head Deaconess from 1870, when the Home opened, until her death in April 1890. Under her direction, the deaconesses wore simple gray uniforms with white collars and a white hat, and the girls wore gray uniforms made by members of the Guild of St. Paul's Episcopal Church. Sister Margaret is buried in the Appleton plot at Rose Hill Cemetery in Macon. In the fall of 1874, Sister Margaret was joined by Katherine Burt, who also came from New Orleans. Sister Katherine was born in Pendleton, South Carolina. She worked beside Sister Margaret, took over as Head Deaconess in 1890, and served in this capacity until her death in 1905. Mrs. Sarah Elizabeth Godwin Marks, born in New Jersey, arrived at Appleton in February 1875 and worked to teach the girls until her death in April 1901. Both Sister Katherine and Sister Sarah are buried in the Appleton plot at Rose Hill Cemetery. Miss Mary Francis Gould of St. Simons came to Appleton as a postulant in August 1889. In 1891, she was set apart as Sister Mary in St. Paul's Church by Bishop Weed of Florida. She left Appleton in July 1898 to work under Bishop Cleland Kinloch Nelson, third bishop of the Diocese of Georgia. Miss Maggie Perkins was received into Appleton as a sister in September 1897. She left the Home shortly afterward in February 1898. Miss Louis Aydelotte came to Appleton from Tullahoma, Tennessee, as a visitor seeking to become a postulant. She was received at Appleton as a deaconess by Bishop Nelson, assisted by Rev. H.D. Judd and Rev. F.F. Reese, in November 1898 in Beckwith Chapel. Due to poor health, she departed Appleton in the fall of 1912 and returned to Tullahoma. She died while staying with her nephew George Aydelotte in Hanford, California. Miss Elenor Beatrice Henry was born in London, England, and came to the United States in 1904. She was received as a deaconess at Appleton on New Years Day 1911. She served officially as Head Deaconess for a decade, but due to poor health, she took a leave of absence in 1920 and went to England to see her family. In 1922, Bishop Henry J. Mikell officially retired Sister Elenor. Although she returned to the United States in 1923, she never returned to Appleton and apparently died in England. Sophjenlife Peterson was born in Peru to missionary parents, but was orphaned and sent to Appleton in 1885. She grew up at Appleton, and when she came of age, she expressed the desire to become a postulant. Sister Katherine insisted that she leave Appleton in 1891 and see something of the world. She returned in 1905 and was received as a deaconess. Sister Sophie played the violin and taught music to all of the girls. She became Head Deaconess upon the retirement of Sister Elenor. Sister Sophie oversaw the transfer of Appleton from the College Street campus to the suburban campus on Forest Hill Road. When she retired in 1935, the diocese transferred the supervision of Appleton to a series of priests. She remained close to Appleton until her death in 1967. Sister Sophie was the last member of the Order of St. Katharine and is buried in the Appleton plot at Rose Hill Cemetery. Miss Katie L. Campbell lived for nearly 50 years with her mother in Mobile, Alabama. About 1920, Katie moved to Arden, North Carolina, where sources link her to a local Episcopal school for boys. About 1923, Miss Campbell came to Macon and was received as a deaconess at Christ Church. By 1924, she had joined the staff at Appleton and worked with the youngest children in the home. She moved, along with Sister Sophie, to the new campus on Forest Hill Road and continued to serve until her death in 1929. She is buried in the Appleton plot in Rose Hill Cemetery.